At 8am Thursday, November 7, the eye of Super Typhoon Yolanda was spotted at 712 kilometers East of Hinatuan, Surigao Del Sur with maximum sustained winds of 215 kilometers per hour near the center and gustiness of up to 250 kph. It is forecast to move West Northwest at 30 kph. 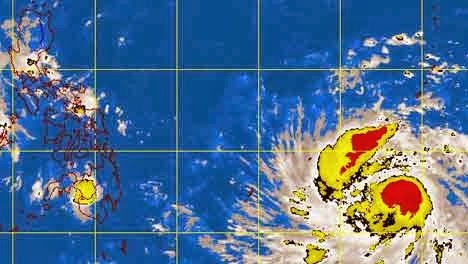 In its latest weather bulletin, state forecasters said the estimated rainfall amount is from 10 to 30 millimeters per hour (heavy to intense) within the 600-km diameter of the super typhoon. Sea travel is risky over the eastern seaboard of Southern Luzon and Eastern Visayas, PAGASA said. Super Typhoon Yolanda is expected to make landfall over Eastern Visayas afternoon of Friday, November 8. It is said to be the strongest cyclone to hit the country this year.